I have to say, my expectations of the Jorvik Viking Centre in York are pretty high; It is the best-known museum in England dedicated solely to the Vikings, complete with assistants in fancy dress and a ride in a roller coaster-esque buggy. Even though you are required to pay upon entry, your payment covers not only one visit, but a whole year’s worth, which is pretty good value. So, walking into the first room, I am greeted by a medieval clothing-clad man of York, donning a long ginger ponytail and matching beard. Although I don’t really see any sign of the female Viking or her medieval Yorkshire counterpart in this introduction, everything seems to be pretty gender neutral. Mini television screens provide me with timelines detailing the Viking incursion of Britain. There is no mention of the female Viking warrior, which I find interesting as it is not only en mode to depict the Norse female in battle in popular culture, see for example the History Channel’s The Vikings, but it is also an intriguing and fascinating element of their society. Whether you believe it to be true or not, for there is much debate amongst academics as to its truth or myth, it is noteworthy that a female warrior is even a possibility at this time; there is something inherent therefore in Viking culture which encourages this debate to even take place. I can only assume however that it is a notion which is disregarded by the historians of the Jorvik Centre. I must say that I am not one of those who ardently adheres to the idea, but a mention of it would have been worthwhile to demonstrate that women were perceived differently in Viking culture. The introduction anyway was helpful and gave good grounding for the exhibition. Still with high hopes of seeing women feature as a prominent element of the centre, I follow my feet towards the ride. That famous Jorvik ride. All alone, I am guided onto some sort of capsule in which I had to hold my head firmly against the head rest to ensure that I heard the audio aid. Thus feeling slightly robotic following the tracks of the tour, the capsule transported me back to Viking Age York, or ‘Jorvik.’ Along the way, I was greeted with creepy mannequins of all ages, but certainly with more men than women. The men were crafting, or performing metal work, while the two or three women who did feature were buying food for dinner or arguing with her husband about what to have for dinner, (no fabrication, there was in fact a couple arguing about what to have for dinner). They moved and spoke, (in Norse, which was pretty cool), and I was showed a day in the life of a medieval ‘Yorkist.’ (The smell by the way in the Jorvik Centre is very distinct and unpleasant, but is apparently a true representation of the smells which would grace the nostrils of every passerby). Although I am feeling enlightened as to the goings on, I am increasingly feeling like women appeared to take a back seat. This, I feel could be attributed to one of four things: the exhibition has either simply assumed that, being women, they naturally tended to take more of a back seat in medieval culture as a whole; the Vikings in fact did not demonstrate any notably different treatment of women; Viking-age Britain, (which is quite likely), was not particularly receptive of the Viking’s attitude towards women, or simply that Jorvik did not feel it necessary to demonstrate these differences in the two societies which co-inhabited medieval York. I discover that as Viking Age York became richer, houses grew to two stories; our medieval counterparts ostensibly had the same diets as us and I even get to see a Viking visiting the toilet chamber, complete with a graphic noises and an unmistakable face of toilet-turmoil. All in all, the ride is great and does a great deal to present these people, who are often perceived as the ‘other’ in academic study and popular imagination, in a more personal and human light, which I think is both necessary and just. 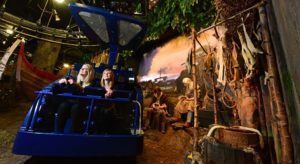 The ride, however, and the exhibition as a whole does tend to subconsciously assume that women were not prominent players in native Viking society and the culture they both moulded for themselves and adapted to here in Britain. Although I felt enlightened by the exhibition’s eye for detail in presenting these Vikings as butchers, bakers, craftsmen and all those things necessary to medieval society, with artefacts on display and archaeological evidence to support its presented theories, I would have liked to see more of a balanced representation of the Viking approach to gender, and how that inevitably changed when they reached the British shores. There is no denying that the Vikings did have a different approach to the sexes and sexuality; societies from all over the world embodied varying ideals of the relationships between the sexes. It is interesting however that a society so geographically close to Britain demonstrably conceived very different ideals of women, (which is evident in their literature, see The Sagas of the Icelanders for example, their social hierarchy and their religion). That is not to say that women were necessarily perceived as either superior or even equal, but certainly different, and this is something I would liked to have seen in the exhibition. The all-too little regard then, for the man and the woman standing as individuals in Viking Age York, ( and that ‘Viking smell’ of course), is the most disappointing element of an exhibition which ticks all the right boxes in every other way: a rollercoaster, (well sort of), bearded hipsters dressed as Vikings and a gift shop flogging all the classics, (which I can never resist going into and coming out with at least a Norse style necklace or a wooden sword). Thank you Tilly for this review, from us at JORVIK Viking Centre. Our portrayal of Viking society is based on interpretation of archaeological evidence, and so we’re always learning and glad for input from our visitors and academics alike. On the question of portraying Viking women, do keep an eye out for some work on this by our team very soon; you may also be interested in this year’s JORVIK Viking Festival, which has the theme of ‘The Untold Story of Women in the Viking Age’. You can find out more about the festival at jorvikvikingfestival.co.uk. For now, thanks again for your review!